From My Front Porch To Yours: HUGE & I mean HUGE Giveaway! HUGE & I mean HUGE Giveaway! Edited: Today Dec 31,2011 is the LAST day to enter this amazing giveaway! I have been chosen to help announce Annie Sloan's 2012 North American Tour! What does that mean to you my readers? Well let me tell ya! It means you are in store for one HUGE giveaway! This is a NATIONAL giveaway and the biggest to date! Anyways, wanna know what ya can win!? You can enter to win one of the Annie Sloan Chalk Paint Holiday Baskets being given away by over 100 Stockist across North America! 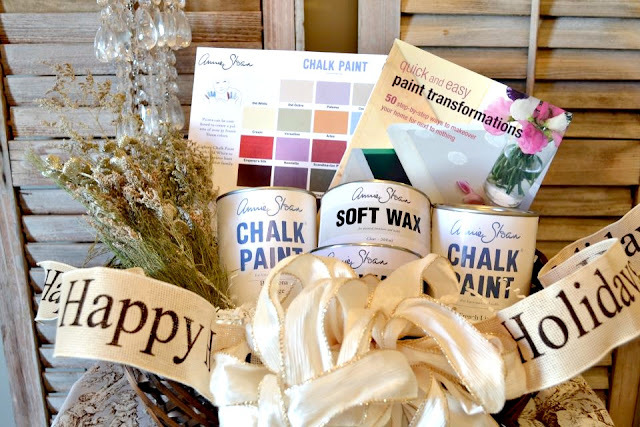 Each basket will include two fabulous pots of Annie Sloan Chalk Paint, Annie Sloan soft wax in clear & dark, and Annie's book Quick & Easy Paint Transformations. Plus there is even MORE! In addition to the holiday basket giveaway, a lucky winner of the holiday basket from EACH shop across North America will be entered for a chance to win a $350 gift certificate from Annie Sloan Unfolded. It will be good toward your choice of a credit on your Annie Sloan American Tour registration fee or $350 in Annie Sloan Chalk Paint! The big winner will be announced on Annie's blog on January 10,2012. Can it get anymore exciting than that!? So here is what ya have to do to enter. 1) Become a follower of Annie's blog and comment "American Tour 2012". 2)"Like" Magnolia Lane on Facebook and then come back here and tell me you did. 3) If you "Follow" From My Front Porch To Yours on here or on FB leave me a comment here. If you do both then leave two comments. 4) If you Blog or FB about Magnolia Lane's Giveaway leave me a comment! 5) And last but not least if ya live in the Cape May, NJ area be sure to stop by Magnolia Lane to enter for another chance to win! Giveaway will end New Years Eve! P.s. I am hosting this giveaway just as a thank you to my readers for being such great bloggy pals! 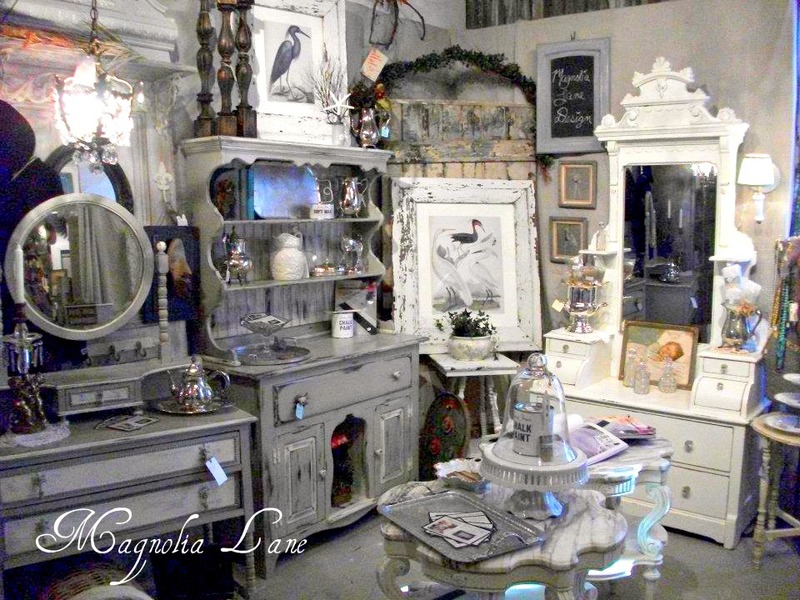 Annie Sloan Chalk Paint is a WONDERFUL product that I use all the time. I am NOT receiving any reimbursement at this time for hosting. My opinions on this product come from my own experience in using this product! I went over and "liked" Magnolia Lane. I likrf you on FB and liked" Magnolia Lane. I also follow you. this is a huge giveaway. Wonderful Giveaway...thanks for the chance to win! I'm a follower! I'm following Annie Sloan...thanks so much for the chance to win! Oouu Pam! I would love to win this basket especially with that "how to" book. I am one of your regular followers! Oh yeah! You know I follow you on facebook too! What a great giveaway! Just added a link on my sidebar to your giveaway. Thanks again! Wow, what a giveaway! I follow you on Facebook. I "followed" Annie's blog and commented on the tour. I "liked" Magnolia Lane on Facebook. What on God's green earth is a "stockist"? I love Annie Sloan and I follow you! Let me win please! I liked Magnolia Lane on FB! I liked Magnolia Lane on Facebook too! I follow Annie's blog too! I follow your with GFC! A am following Annie's blog! "American Tour 2012"! I liked Magnolia Lane on FB! American Tour 2012! I am an avid followers, and I just luv you Pamela! I have put your giveaway on my sidebar! So exciting the great Annie Sloan 2012 American Tour! I have been following awhile and this is a great giveaway! So exciting that AS is coming for a tour! Magnolia Lane looks wonderful and I love Cape May. We have been there many times on our way to visit family in South Jersey.I wish I had seen this shop on one of my visits.Maybe next time! I am following AS's blog now and 'liked' Magnolia Lane on FB. Thanks for the chance to win I am not on FB but I am a follower of both blogs and I have mentioned the give away on my blog and linked it to yours Thanks again for the great give a ways and the wonderful ideas you share. I love (like) Magnolia Lane of FB. I love your style and have fun following all your great projects. Wow, what an amazing give-away! I'm following your blog, Magnolia Lane on FB & blog and sharing this contest on FB! Thanks so much!! Hi Pamela! Ok...found all your linky stuff at the bottom of the blog. Yes, I now follow you. Thank you for hosting the very fun mantel party! I like Magnolia Lane on FB now. And I am now following Annie's blog. Glad to know she has a blog now. I just love her paints. I am following Annie's blog and love her stuff. Would love to win them. I am following you too, #594 to be exact. What a wonderful giveaway! Hope I win. Merry Christmas! I follow Annie's blog. American Tour 2012. I liked Magnolia Lane on FB. I follow From My Front Porch to Yours. I am following Annie's blog and commented! I follow Annies Blog and left a comment! Again, excited for the American Tour 2012! happy I found you and Magnolia Lane. I liked Magnolia Lane on FB!! I'm a follower on AS's blog but it won't let me leave a comment. Stephanie at Magnolia Lane is my stockist! I'd LOVE to win! I "liked" Magnolia Lane on Facebook! thank you!!!! Hey Following you on your blog! I liked Magnolia Lane on FB! I see what u mean, I'd also be in big trouble if I was anywhere near there!! Following Annie's blog! American Tour 2012! I am following your blog and loving it! I am also following you on FB! Yep I did a shout out to FB about the Magnolia Lane give away http://facebook.com/​lolaandbea . would love to win this chalk paint! I also liked Magnolia Lane on FB. I am a follower of Annie's blog the American Tour 2012 is exciting. I have been following your blog for some time and always enjoy visiting here. I like Magnolia Lane on Facebook. Cordy Schroeder,PA, Please enter me to win Annie Sloan Chalk Paint! Angie Paino,Brick, NJ, I hope I win, need to paint everything! Linda Kahrs, Howell, NJ, I would love to win some Annie Sloan Paint! I follow magnolia lane cp nj. Joann Bock Kiewert, enter me to win Annie Sloan Paint Please! Nanette LoBiondo Galloway, enter me to the giveaway please! Susi Trenery, would like to enter the giveaway, need that paint! Sandy Rossell Brown, I want to win the Annie Sloan Giveaway!!!! Gina Brock, please enter me to win Annie Sloan Chalk Paint! Diane Mundhenk, Cape May, NJ, Please enter me to win some AS paint! Sue Rooney Ruggiero, Wirtz, VA, Please enter me Steph, I need paint! Sue Gilbert, please enter me to win Annie Sloans giveaway! Kim Kelly, Deleware, I would love to win Annie Sloan Chalk Paint! Lynne Murphy, Brick, NJ, I would love to win the giveaway! Gillian Perl Wade, SC, like Magnolia Lane, enter me please. Ingrid Spears,NJ, love Magnolia Lane, Please enter me to win AS paint! Cindy Smilyk, Cape May, love that paint, enter me please! Lissette Blanco, Carteret, NJ, enter me please, love Magnolia Lane, Cape May. Patrice Callahan, Cape May, enter me, I love Annie Sloan Chalk Paint and Magnolia Lane! Maricela Campos, NJ, please enter me to win, love Magnolia Lane! Christine Ford, Pt.Pleasant, NJ, I like Magnolia Lane and want to win Annie Sloan Chalk Paint! Wendy Guiles, Cape May, NJ. I love Magnolia Lane and Annie Sloan Paint! Ingrid Hartzell, Cape May, NJ, like Magnolia Lane and enter me to win. Lynnette Ianaron, Brick, NJ, like Magnolia Lane, enter me to the giveaway please. Lori Auriemma Kearns, Brick,like Magnolia Lane, enter me in the giveaway please! I need paint! Thanks for the chance to win Annie's paints. Liked Magnolia Lane on Facebook!!! fan! Fan! love the paint! want it all!